Aeration of your lawn lets’ your lawns breathe by reducing soil compaction and allowing oxygen to reach the root system. Aeration tines penetrate the soil and eject soil cores onto the surface where they break down by providing your lawn nutrients. 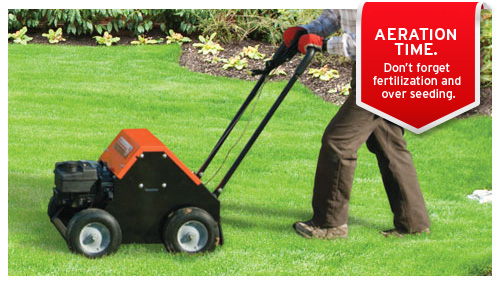 How does Aeration help my lawn? Lawn Aeration Removes 50 percent of thatch. Watering savings up to 60 percent. (Water is able to penetrate the ground and go straight to roots. Provides root zone with oxygen. Encourages roots to grown down versus sideways. Helps defend your lawn against drought and weeds. Promotes thicker, healthier greener lawns. Reduces Compaction loosens compacted Soil. Drought Resistant: Grass will be able to access water a deeper level. Makes your soil healthy promoting a healthy lawn. Aeration is recommended for over seeding for optimal results. We recommend once annually. No more than three times annually. Early Spring Early Fall or both. Have lawn-mowed low, water the night or morning before for good core penetration. Irrigations system head should be marked with flags. This will ensure them form being damaged.